When Kid’s Play Spaces Take Over YOUR Spaces! Guest posting today is Amy Fazackerley, creator of the awesome Lay-n-Go toy storage product line that I love. 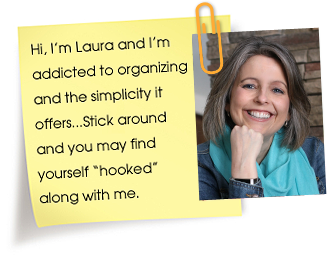 Amy is also one of our terrific sponsors for the 29 Day Organizing Challenge. Welcome Amy! It happens to every household: once your kiddo is about 5 years old, “the plastic toy tide” begins to rise. 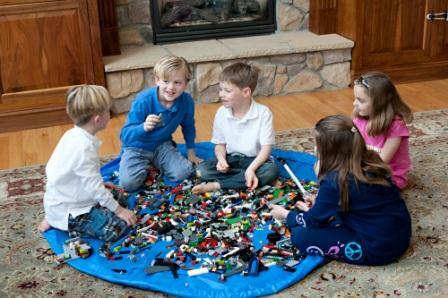 The small toys and bits and pieces from sets of LEGOs, Polly Pockets and various tiny toys begin to spill out of the child play spaces and an ocean of feet puncturing tiny thingamajigs flood the grown up spaces of your home! You CAN fight it. There are ways to stuff the toy tornado back into a tamed play space environment. Coaching kids on organizing their own gear in the first place is key to teaching them future responsibility skills (and keeping the clutter out of the living spaces!). Make sure there is a place for everything and help kids slow down and play with a few items at a time cleaning up before moving on. Make clean up a game—as Mary Poppins suggests! Use a timer for competitive personalities, and dress up as the ‘Cleanup Monster’ for creative tykes! As older siblings become more interested in toys and games with smaller pieces, it’s important to pay attention to where those pieces land especially with toddlers around! Use a gate to corral the older kid and keep potentially choking-hazard toys away from the toddler. Another option is to only use the tiny toys during nap time of the younger sibling. Make it fun time for your ‘big kid’ by sitting down with them to play with marbles, magnet toys and other itty bitty baby no-nos! Shared family spaces exist in more than just the home. It’s a given that kids will want to bring along family toys and gadgets on vacations, but they tend to take over the small spaces! Be judicious in what you choose to bring along. Precious toys might get lost, larger items won’t fit in luggage or store well in a tiny hotel room and think about toys that can double as a pillow on an airplane! If they love the play space they’ll want to be in it more, paint the playroom (or even an extra under the stairs space) bright fun colors and help their imagination go wild. Hire a budding artist to paint a mural on the wall, or paint one side in chalk board paint and let your own child become the budding artist! 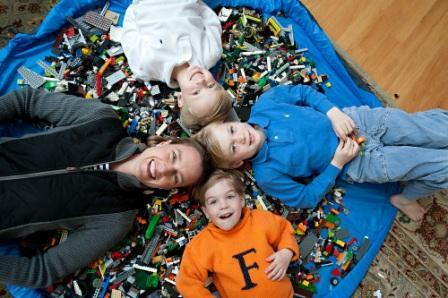 Amy Fazackerley, mom of three young rambunctious boys, needed a solution to organizing the mountain of LEGOs growing in her living room. Sheets and bins weren’t cutting it and she invented the Lay-n-Go activity mat and cleanup solution (It’s a cinch…Literally!). She and her husband love finding new solutions to create a clutter free lifestyle for their family of five both at home and on-the-go. To learn more, visit them at www.layngo.com and join the conversation on Facebook and Twitter. 6 Responses to When Kid’s Play Spaces Take Over YOUR Spaces! Love it! We usually lay a blanket out for the kids legos and other small toys, but this is so much better! Thanks for your comment. Funny, that is how Lay-n-Go got started! I used to use either an old blanket or table cloth myself. 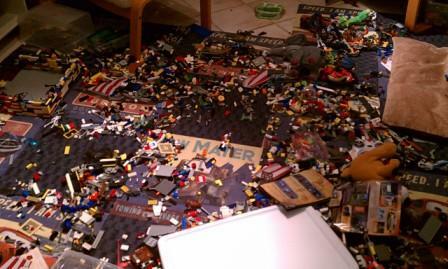 One night, after several “pick-up” sessions, not being able to transport the bundle of LEGOs in the sheet, or store them without having to dump them back into the bin, I decided that I was going to do something about it. That was the night that Lay-n-Go was born! I was so impressed that when turned upside down none of the little pieces fall out! Thanks! That was the kicker…I had to invent a solution that would foster my kids’ creativity on-the-go! I wanted to engage them with something other than the DSI or my cell phone. With the LITE, my boys now take their LEGO mini figures and toy pieces everywhere. They are great for the restaurant or the plane tray table. The Lay-n-Go works because not only does it provide a CLEAN surface area in a public setting, but the Lay-n-Go KEEPS their tiny toy pieces safe from falling out!!! It is also totally washable, when you get home. I do recommend using large plastic boxes in kids room. It can be used to put everything into boxes when cleaning. Lego has an awesome organization system which consists of 6 briefcase style plastic boxes that neatly stack in a drawer shelving system. It is great. If we travel my son just grabs one of the briefcases to take on the trip. It is about 7 in. deep and can fit a lego base plate inside it. great product!